Fixed one thing, caused something else to mess up. 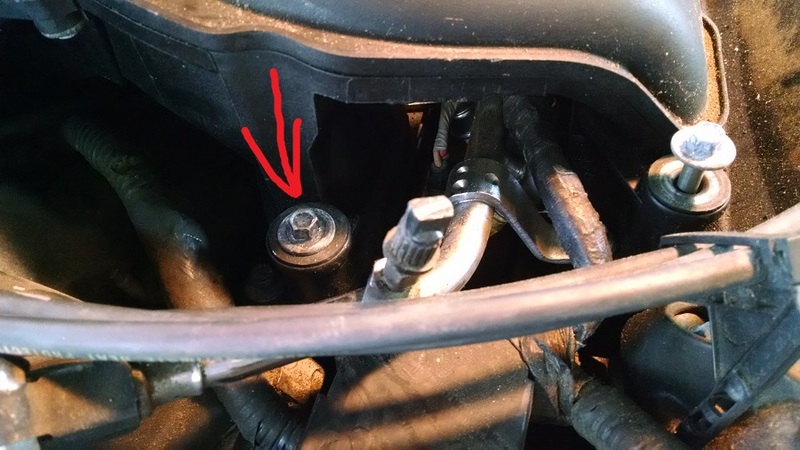 Free Spinning Intake manifold bolt, that WILL NOT COME OUT!! Any idea's on HOW to get this bolt out? It is tight feeling, you have to use a ratchet on it. You cannot spin it with your finger, it is tight. I have tried to put pressure on the bottom of the bolt shot, and ratchet at the same time, but that is a no go. It just spins and nothing else. Any clues on how to get this piece of crap out of this thing? I would cut the hex off the bolt with a Dremmel, remove the upper intake, and see what is going on. Going to have to find something else to use besides that. As I do not have one. Grab it with Vise Grips and pull up and turn at the same time. I will give that a shot tomorrow morning. I tried it, and it is a no-go. So, I am going to Walmart today and to Lowes. To see if I can find a grinding wheel to go on my drill. I have a small 18v drill that I will be able to use to grind the head of the bolt off with. Ford needs to be slapped silly for this stupid design. It is about as bad as placing the horn switch on the blasted turning signal on my 83 Ranger. One stupid mistake after another. I love Ford, my favorite trucks. But with the issues with this blasted car, I am starting to hate it. See pic, the bolt threads into a brass slug molded into the lower intake plastic. If it is turning free, likely it is not holding. Loosen all the others and it may just pull off with the UIM. Then is the issue of how to fix the threads. Last edited by chartmaker; 08-16-2016 at 01:29 PM. Oh, that tiny picture, hard to see what you are supposed to be looking at. I tried to pull up on it yesterday, and it did not budge. I just went out there and tried it one more time. And it will not budge. I even tried it with a flathead screwdriver at the bottom of the bolt chamber, and still nothing. So, going to have to go with the grinder, and hope I can get it past the bleeder from the fuel rail. OK, cut the head off the bolt. Picked up the Dremel Cutting kit. It fit on my drill which was good. Lowes had it on sale, $16.45 with tax. So, I have not take the rest of the bolt out yet. But I got to see what I needed to see, and that is the water lines connected to the firewall.